Manhattan Scientifics Announces Commercial Introduction Of NanoMRX Precision Nanoparticles | Manhattan Scientifics Inc.
"Nanoparticles are increasingly important in biomedical technologies. We are eager to make Senior Scientifics’ high precision nanoparticles available to the industry. We anticipate applications in separation, targeting, MRI contrast and Magnetic Particle Imaging (MPI)." ALBUQUERQUE, N.M. -- Manhattan Scientifics (OTCQB: MHTX) announced today a collaboration with Azano Biotech that will make NanoMRX Precision Nanoparticles available for purchase. Typically, only a small portion of nanoparticle lots from existing suppliers are actually the size requested. NanoMRX particles are provided in sizes from 5nm to 30nm, with a variation of only +/- 0.5nm. Senior Scientifics’ president, Gerald Grafe stated, “We developed these high precision nanoparticles for our own cancer detection technology. Now we are pleased to make them available for other applications. We believe Azano is a great partner for this effort, because they already reach the community who will benefit most from the use of our precision NanoMRX nanoparticles. 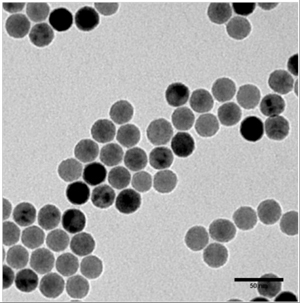 “The market for precision nanoparticles is still in its infancy but early indications suggest a good deal of interest from a number of potential users,” Grafe continued. Azano Biotech is committed to providing essential research tools to the scientific community that will accelerate biomedical discovery and ultimately improve human health.